The Des Moines Water Works is asking concerned citizens to weigh in on the practice of adding fluoride to the city’s water supply. 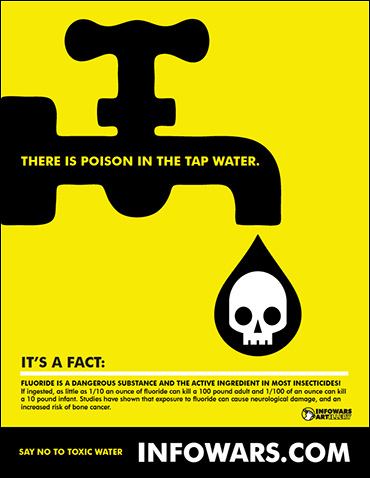 Click to download a PDF version of Infowars’ informational fluoride poster, and get the word out on water fluoridation health hazards. Last month, the independently operated public utility provider, which services “approximately 500,000 people in the Greater Des Moines area,” began asking the public “to submit written comments and/or information” supporting or opposing the adding of the chemical hydrofluosilicic acid to drinking water. “While several scientific associations, including the American Dental Association, the U.S. Public Health Service, the U.S. Department of Health & Human Services, and the American Medical Association, are supportive of fluoridation to improve dental health, others have questioned the scientific and policy basis for fluoridation, citing research that points to adverse health consequences from fluoride exposure,” the Des Moines Water Works’ website states. The utility is currently taking comments until the end of November, after which its staff will present reports to the Water Works’ Board of Trustees on two separate days in December. Over 200 comments have flooded the Water Works website with a vast majority of them supporting the removal of fluoride from the city’s tap water. “Fluoride is a poison when ingested. To do any good it needs to be applied directly on teeth. I have been filtering it out for years. Fluoride should NOT be added to our water,” one commenter notes. 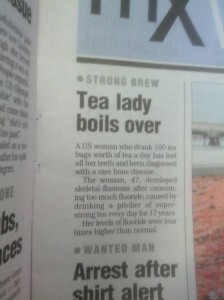 Newspaper clipping shows 47-year-old woman suffered tooth decay and skeletal fluorosis after using hundreds of fluoride-containing tea bags. Click to enlarge. Critics of fluoridation link to several studies that demonstrate the detrimental effects fluoride has on IQ, such as the Harvard study produced last year that found “strong indications that fluoride may adversely affect cognitive development in children.” Pro-fluoride fanatics later attacked the study’s science claiming it only found that fluoride affects the neurodevelopment of children in China. However, other commenters support the adding of the corrosive chemical to municipal water supplies. Indeed, when hydroflusilicic acid was spilled outside of one water utility facility in Illinois, it began eating through concrete and required a team of men in hazmat suits to clean it up, as another commenter also noted. If Des Moines Water Works’ Board of Trustees does decide to ban fluoride, they would not be alone. Fluoride is banned in several cities in Canada, Australia and New Zealand and in many European cities. While the utility may still decide not to honor the public’s request to remove the toxic chemical, the fact that they have put the issue up for debate is reassuring and should be seen as a quasi-victory for those who wish to live a more natural, healthy life. Kudos to the Des Moines Water Works. Anyone wanting to learn more on “how hazardous waste ended up in our drinking water” should check out the book, “The Case Against Fluoride,” conveniently available at the Infowars Store.